Many of the details of Bullock's early life are lost. He was born in Amherstburg, Upper Canada (now Ontario) on the Canadian side of the Detroit River. His father, retired British Army Sergeant Major and hero George Bullock, was known to be active in the politics of Sandwich, Upper Canada (later renamed Windsor, Ontario). He has been mistakenly believed to be related to British General George Bullock, Governor and Commander-in-chief of Bermuda; however, Lieutenant General Sir George M. Bullock was a boy and young man during Seth's exploits in Deadwood. Seth's mother was a Scotswoman named Anna Findley Bullock. Bullock was apparently not happy at home. His father was a strict disciplinarian, known to beat young Seth for minor infractions. Bullock ran away first at age 13, then again at age 16 to Montana to live temporarily with his older sister, Jessie Bullock. By age eighteen, he had permanently left home. In 1867, Bullock became a resident of Helena, Montana, where he unsuccessfully ran for the Territorial Legislature. He was subsequently elected as a Republican to the Territorial Senate, serving in 1871 and 1872 and helped create Yellowstone National Park. In 1873, he was elected sheriff of Lewis and Clark County, Montana. During his tenure as sheriff, he killed his first man, Clell Watson. Watson had stolen a horse and engaged in a gunfight with Bullock, in which Bullock was slightly wounded in the shoulder. Watson was then taken into custody. Watson was prepared to be hanged, but a mob appeared and scared off the executioner. Bullock climbed the scaffold and pulled the lever, sending Watson to his death. Bullock then held off the mob with a shotgun. This incident was recreated on HBO's Deadwood, except that Watson was hanged on the step of the sheriff's office. Around this time, Bullock and Sol Star opened a hardware store. In August 1876, he and Star decided that an untapped market for hardware existed in the gold rush town of Deadwood in the Dakota Territory. The two purchased a lot in Deadwood and set up shop there as the "Office of Star and Bullock, Auctioneers and Commission Merchants," first in a tent and then a building. Deadwood was a lawless, rowdy camp. The day after Bullock's arrival, Wild Bill Hickok was murdered by Jack McCall. McCall shot Hickok in the back of the head while he sat playing poker. McCall was later found not guilty by an impromptu camp court and released, after which he promptly left town. The demand for law enforcement grew following Hickok's murder and Bullock's background made him the logical choice for Deadwood's first sheriff. Bullock took his job seriously, deputizing several residents and tackling the job of civilizing the camp. Despite (or perhaps because of) a reputation for fearlessness and an uncompromising nature, Bullock managed the task without killing anyone. Bullock had several 'run ins' with Al Swearengen, proprietor of the notorious Gem Theater, Deadwood's most notable brothel. Swearengen had a knack for making money from vice and shrewdly invested some of his profits in cultivating alliances with the camp's wealthy and powerful. When appointed sheriff, one of Bullock's first duties was to confront Dodge City Deputy Marshal Wyatt Earp, who was possibly interested in the sheriff's job. Bullock told Earp that his services were not needed. A week later Earp left Deadwood to return to Dodge City. Having attained some stability in Deadwood, Bullock brought his wife Martha Eccles Bullock and daughter to town from her parents' home in Michigan, where they had been living during this period. They had one daughter, Margaret, at the time of Martha's arrival in Deadwood, and they subsequently had another daughter, Florence, and a son, Stanley. Bullock and Star purchased a ranch where Redwater Creek met the Belle Fourche River and dubbed it the S&B Ranch Company. Bullock is also credited with introducing alfalfa farming to South Dakota in 1881. Later he became a deputy U.S. Marshal, partnered with Star and Harris Franklin in the Deadwood Flouring Mill, and invested in mining, the local growth industry. Bullock and Star eventually expanded their business interests to the towns of Spearfish, Sturgis, and Custer. Bullock, then a deputy sheriff from Medora, North Dakota, met Theodore Roosevelt in 1884 while bringing a horse thief known as Crazy Steve into custody on the range, near what would become the town of Belle Fourche. The two became lifelong friends, Roosevelt later saying of Bullock, "Seth Bullock is a true Westerner, the finest type of frontiersman." Bullock and Star contributed further to the economic development of the region by convincing the Fremont, Elkhorn, and Missouri Valley Railroad to build a track by offering them 40 acres (16 ha) of free right-of-way across their land when a speculator purchased the right of way to Minnesela and demanded a high price from the railroad. The railroad built a station three miles (5 km) northwest of Minnesela in 1890, and Bullock and Star were instrumental in founding the town of Belle Fourche, offering free lots to anyone moving from Minnesela. Belle Fourche became the largest railhead for livestock in the United States and the county seat was changed from Minnesela to Belle Fourche. Bullock and Star's hardware store in Deadwood burned down in 1894. Rather than rebuild, they built Deadwood's first hotel on the site—a three-story, 63-room luxury hotel. The Bullock Hotel continues to operate to this day, now incorporating a casino. 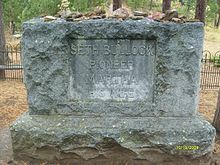 Seth Bullock's grave at Mount Moriah Cemetery, Deadwood, South Dakota. Bullock's friendship with Roosevelt led to his becoming a Captain of Troop A in Grigsby's Cowboy Regiment. This was another volunteer cavalry regiment which Congress authorized in the Spring of 1898. It was similar in composition to Theodore Roosevelt's Rough Riders which saw action in Cuba during the Spanish–American War. Although the troop never left training camp in Louisiana before the war ended, Bullock still earned the rank of captain. When Roosevelt became vice president under President William McKinley, he appointed Bullock as the first forest supervisor of the Black Hills Reserve. After Roosevelt was elected president, Bullock organized 50 people (including Tom Mix) to ride in the inaugural parade in 1905. Bullock was then appointed U.S. Marshal for South Dakota for the next nine years. Roosevelt later selected Bullock as one of 18 officers (others included Frederick Russell Burnham, James R. Garfield, and John M. Parker) to raise a volunteer infantry division, Roosevelt's World War I volunteers, for service in France in 1917. Congress gave Roosevelt the authority to raise up to four divisions similar to the Rough Riders; however, as commander-in-chief, President Woodrow Wilson refused to use the volunteers and the unit was disbanded. After Roosevelt's death in January 1919, Bullock created a monument to him with the aid of the Black Hill Pioneers, dedicated on July 4, 1919, on Sheep Mountain, which was renamed Mount Roosevelt. Bullock died of colon cancer shortly thereafter, on September 23, 1919, at his home at 28 Van Buren Street in Deadwood. He is buried in Mount Moriah Cemetery in Deadwood, along with Wild Bill Hickok and Calamity Jane, with his grave facing Mount Roosevelt. Bullock's grave is more than 750 feet away from the main cemetery grounds. Seth Bullock was portrayed by Timothy Olyphant in HBO's TV series Deadwood. ^ a b c Wolff, David A. (2009). 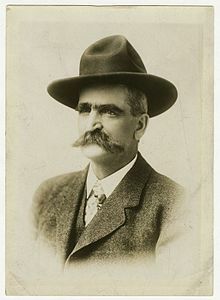 Seth Bullock: Black Hills Lawman. South Dakota State Historical Society Press. pp. 11–14. ISBN 978-0-9798940-5-3. ^ a b c d Shadley, Mark; Wennes, Josh (September 4, 2012). "The Bullock Hotel". Haunted Deadwood: A True Wild West Ghost Town. Arcadia Publishing Incorporated. pp. 60–63. ISBN 978-1-61423-675-7. ^ "U.S. Marshals Service, History, United States Marshal Seth Bullock". Usmarshals.gov. Retrieved July 18, 2012. ^ McClintock, John S. (1939). Pioneer Days in the Black Hills: Accurate History and Facts Related by One of the Early Day Pioneers. University of Oklahoma Press. pp. 166–167. ISBN 978-0-8061-3191-7. ^ Stasi, Paul; Greiman, Jennifer (December 20, 2012). The Last Western: Deadwood and the End of American Empire. Bloomsbury Publishing. pp. 33–34. ISBN 978-1-4411-2652-8. ^ Seth Bullock. 1893 Theodore Roosevelt Birthplace National Historic Site. http://www.theodorerooseveltcenter.org/Research/Digital-Library/Record.aspx?libID=o283087. Theodore Roosevelt Digital Library. Dickinson State University. ^ a b c d Dary, David (2007). "Who was Seth Bullock?". True Tales of the Prairies and Plains. University Press of Kansas. pp. 117–120. ISBN 978-0-7006-1518-6. ^ Ames, John Edward (2004). The Real Deadwood: True Life Histories of Wild Bill Hickok, Calamity Jane, Outlaw Towns, and Other Characters of the Lawless West. Chamberlain Bros. p. 103. ISBN 978-1-59609-031-6. ^ Hagedorn, Hermann (1921). Roosevelt in the Bad Lands. Houghton Mifflin. pp. 459–460. ^ a b c Stephens, John Richard (3 October 2016). Wildest Lives of the Wild West: America through the Words of Wild Bill Hickok, Billy the Kid, and Other Famous Westerners. Rowman & Littlefield. pp. 256–257. ISBN 978-1-4930-2444-5. ^ Bleyer, Bill (October 3, 2016). Sagamore Hill: Theodore Roosevelt's Summer White House. Arcadia Publishing. pp. 87–88. ISBN 978-1-4671-1809-5. ^ Roosevelt, Theodore (1917). The Foes of Our Own Household. New York: George H. Doran company. p. 347. LCCN 17025965. ^ Gildart, Bert; Gildart, Jane (2005). Hiking the Black Hills Country: A Guide to More Than 50 Hikes in South Dakota and Wyoming. Globe Pequot Press. p. 60. ISBN 978-0-7627-3547-1. ^ Wolff, David A. (2009). Seth Bullock: Black Hills Lawman. South Dakota: South Dakota State Historical Society Press. p. 163. ^ Project, South Dakota Federal Writers (1 May 2006). The WPA Guide to South Dakota. Minnesota Historical Society. pp. 110–112. ISBN 978-0-87351-552-8. ^ Brode, Douglas (January 1, 2010). Shooting Stars of the Small Screen: Encyclopedia of TV Western Actors, 1946–Present. University of Texas Press. p. 249. ISBN 978-0-292-78331-7.